Weld Mount studs can eliminate welding in hazardous locations such as waste water treatment plants or refineries where explosion could occur. Weld Mount is the ideal way to mount conduit, electrical panels or I&C equipment in these locations. Industrial plants using PLC controlled process equipment often won't allow welding as it creates interference with the computers. Weld Mount is the ideal method for mounting equipment in these conditions. Qualfied Lifting equipment can not be modified by drilling or welding without expensive load testing. Weld Mount can be used to attach wiring or lighting without affecting the certification. 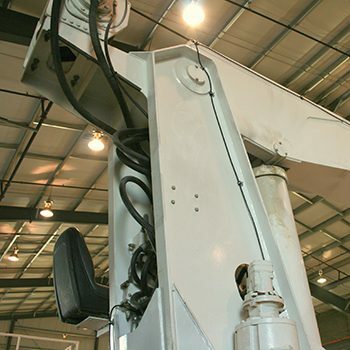 A crane manufacturer needed to run control wiring on a completed crane. Drilling and tapping into heavy plate is time consuming and requires reload testing the crane for certification. Here Weld Mount studs and cushion clamps are used to secure the wiring quickly and easily.